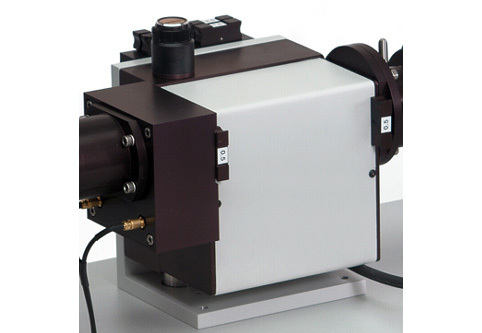 The FluoTime 200 spectrometer is a high performance fluorescence lifetime system featuring modular construction, single photon timing sensitivity and research flexibility. It contains the complete optics and electronics for recording fluorescence decays by means of Time-Correlated Single Photon Counting (TCSPC) and/or Multi-Channel Scaling (MCS). The system is optimized for high temporal resolution and can be used with femtosecond or picosecond lasers, like the picosecond diode lasers from PicoQuant. With the FluoTime 200, decay times down to a few picoseconds can be resolved. The system allows operation at laser repetition rates as high as 100 MHz and count rates up to several million counts/sec. The laser coupling module consists of an iris, a beam steering mirror, an optional replaceable polarizer module and a focusing lens. The iris allows precise adjustment of the excitation intensity and prevents the penetration of room light into the sample chamber. The beam is directed towards the sample by an adjustable steering mirror. An optional Glan-Thompson prism polarizer selects the desired polarization plane of the non-polarized radiation. The beam is finally focused onto the sample by an adjustable lens. NEW The supercontinuum laser Solea can now be offered as an option. 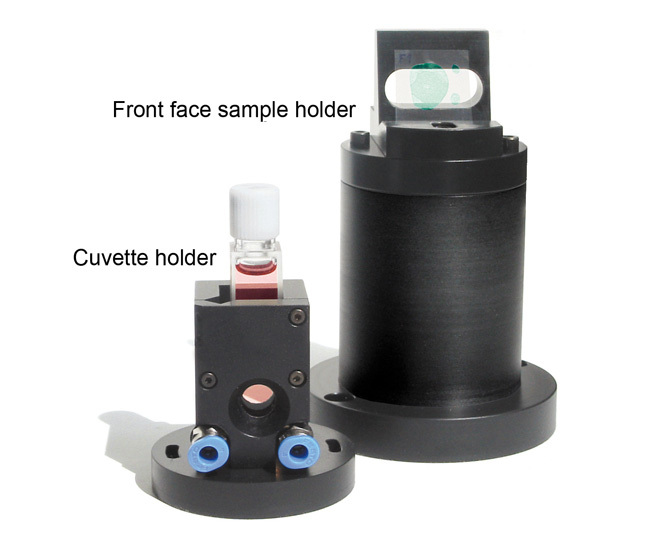 The sample chamber contains a versatile sample holder (standard: cuvette, optional: front face) and a mechanism to protect the detector from excessive light exposition. Temperature control of the cuvette holder is possible by attaching an external thermostat (tubing for the circulating fluid is pre-installed) or by replacing the standard cuvette holder with a peltier-cooled holder. Later upgrades to T- or X-geometry are possible. 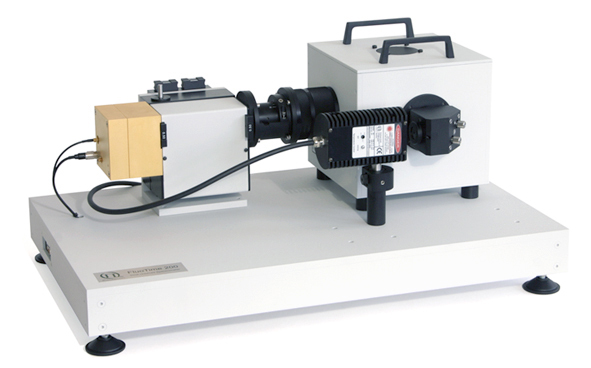 For spectral filtering of the emitted light, a small monochromator is chosen, featuring low temporal dispersion, high throughput and low stray light level. This Seya-Namioka type monochromator has 100 mm focal length and an aperture of f/3.2. The standard configuration contain a 32 mm × 32 mm aberration corrected concave holographic grating with 1200 lines/mm, blazed at 450 nm. The spectral (linear) dispersion is 8 nm/mm. The delivered set of interchangeable slits with 0.5, 1.0 and 2.0 mm width therefore provide 4, 8 and 16 nm spectral bandwidth, respectively. Other gratings are available upon request. The FluoTime 200 uses single photon counting detectors of various types, attached to an exit slit of the emission monochromator. The available detectors are either photomultiplier tubes (PMA Series or NIR-PMTs), Hybrid-PMT modules (PMA Hybrid Series) or Microchannel Plate Photomultiplier Tubes (MCP-PMTs). The detectors offer picosecond temporal resolutions and cover different spectral ranges between 180 nm and 1700 nm. Each detector includes an electro-mechanical shutter and can optionally be cooled. Two outstanding Time-Correlated Single Photon Counting (TCSPC) data acquisition units are available for the FluoTime 200. The TimeHarp 260 is the perfect choice for systems equipped with a detector of thePMA Series or PMA Hybrid Series. Along with a dedicated “long range mode”, the TimeHarp 260 can be used to resolve fluorescence lifetimes in the range of several ten picoseconds and several seconds. ThePicoHarp 300 offers an even better temporal resolution and is therefore recommended for FluoTime 200 systems equipped with a MCP-PMT detector. In that case even fluorescence lifetimes of a few picoseconds can be resoved along with suited excitation sources. Measurement data can be directly transferred to the established FluoFit software for decay analysis. TheFluoFit software features global decay analysis with an easy-to-use graphical user interface and presentation-ready numerical and graphical output. It implements an iterative reconvolution fitting routine with nonlinear error minimization. Various exponential decay models (up to fourth order) or rate constant distribution models can be fitted to the observed decay in order to determine the fluorescence lifetime(s) or to study fluorescence anisotropy, along with rigorous error analysy methods.